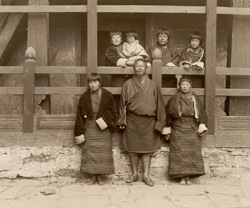 Photograph of the Tongsa Penlop (Governor) and his family at Tongsa (Trongsa) in Bhutan, taken by John Claude White in 1905. This group portrait, posed in front of the wooden verandah of a house, is one of a set of photographs documenting a British mission to Bhutan, led by White, the political officer in Sikkim, to invest the Penlop, Ugyen Wangchuk, with the order of Knight Commander of the Indian Empire. The figures in the photograph are identified as follows: front row - eldest daughter of Thimbu Jongpen, Tongsa Penlop, sister of Tongsa Penlop; back row (on verandah) - younger daughter also married to nephew, grandson of Tongsa Penlop, eldest daughter of Tongsa Penlop's sister, eldest daughter married to nephew of Tongsa. Ugyen Wangchuk was a key player in the politics of Bhutan in the early 20th century. In the 19th century, Bhutan and the British in India had clashed over the control of the duars or passes into eastern India. The hostilities ended when the British, victorious in the Anglo-Bhutan wars, pushed back the frontiers of Bhutan and established the Treaty of Sinchaula whereby the Bhutanese agreed to conditions of peace and ceded claims to the 18 duars. By the late 19th century, power centred upon the Penlops of Paro and Tongsa. The British were now involved in the Great Game with Russia and anxious to gain influence over Tibet. The Younghusband Mission of 1904, set up to negotiate with the Tibetans, passed through Bhutan. The Penlop of Paro remained aloof while the Penlop of Tongsa assisted the mission. He accompanied the mission to Tibet and played an important role as mediator, using the long-established ties between Tibet and Bhutan to help the British negotiate a favourable agreement. Bhutan now operated firmly within the British sphere of influence and Ugyen Wangchuk was popular after his role as mediator with both the British and the Bhutanese. This resulted in the foundation of the hereditary monarchy of Bhutan when Ugyen Wangchuk was elected King of Bhutan in 1907.